When Unity launched last week, piled on top of claims that this is a low point for the series was a frustration with the relevance of the extra hooks the game has to products and services outside the main game: the companion app, the Initiates program and the Helix credit microtransactions in the game. As a professional game developer, I’m no stranger to companion apps or in-game purchases. Not only have I spent the past two and a half years working as a monetization design consultant, but before that I spent four and a half years as a producer at EA, where I led development on companion games that unlocked exclusive items inside of Dragon Age: Origins and Dragon Age II. From my insider perspective, it feels as though we have reached our Horse Armor moment with in-game purchases. We’re at the point where there is public outcry over a business practice which will ultimately become common. Player’s stated preferences on Twitter and in comments may be a hatred of all things microtransaction (MTX), but as it becomes clear to companies that they actually buy these items in meaningful quantities, in-game purchases will become as everyday as Day 1 DLC, Season Passes and purchasable cosmetic items. The launch of the previous console generation brought us HD gaming, higher development and marketing costs, a $60 price tag and downloadable $2.50 horse armor. This current generation brings us even more beautiful games, even higher development and marketing costs and yet the $60 price tag remains. Adjusted for inflation, a $60 game costs the equivalent of $51 in 2006. When it takes 10 game studios working together to create Unity, experimenting with in-game purchases and companion apps as a way to generate additional revenue isn’t greed, it’s survival. Given that price tags are likely to remain anchored at $60, more and more blockbuster games will turn to in-game purchases. 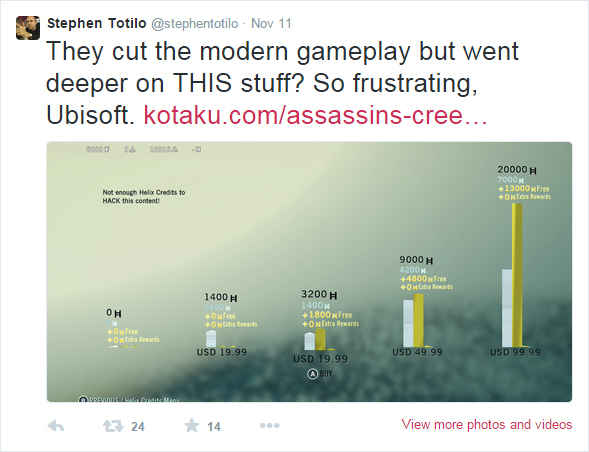 However, just because I think that Unity’s use of MTX and a companion app were inevitable, it does not mean I think they were particularly friendly to those players who bought this new Assassins Creed on launch day (especially those players who pre-ordered or bought it before the review embargo was lifted). In the “what went right” column I was able to charge through the single player campaign with relative ease. Decked out in fully upgraded 5-diamond gear, I finished the campaign straight through without the need to grind. Gearing up wasn’t exactly the same as using a God mode cheat, but I was able to complete the story without too many deaths. Unless I was completely surrounded, tricky combat situations could be overcome by cheesing the smoke bomb and mowing down startled soldiers. I wasn’t exactly transformed into Mordor’s Talion by spending money, but I did not need to act assassinly unless I wanted to. Had I chosen to spend money two and a half hours in, at the moment when I first unlocked the ability to purchase gear, I probably could have rushed through the game in 12 hours or less. In the “what went wrong” column was everything else. The most egregious was the $100 currency package. My #1 rule as a monetization design consultant is that you have to respect your players: a long term relationship with your players is the foundation of all game monetization. As a player who purchased the $100 option, nothing made me feel more disrespected than finishing the game with $56 of Helix credits and nothing to buy. The only options left were gear I hadn’t unlocked (and had no need for) or else buy 74 premium boosts that I did not need thanks to my high powered gear. I’m not usually a season pass person, but I have more than enough Helix to cover the $30 price tag if only the game would let me. Later I would go back to try and figure out just how to level up in Initiates. The webpage I pulled up marked the ability to “keep track of my progress and gain XP” as Coming Soon. At that point I wrote off the idea of opening up a single yellow chest. 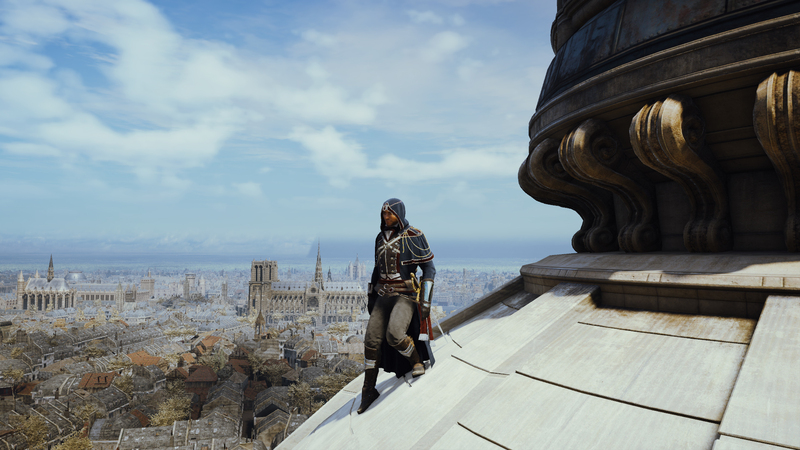 I promptly deleted the Assassin’s Creed® Unity Companion app. 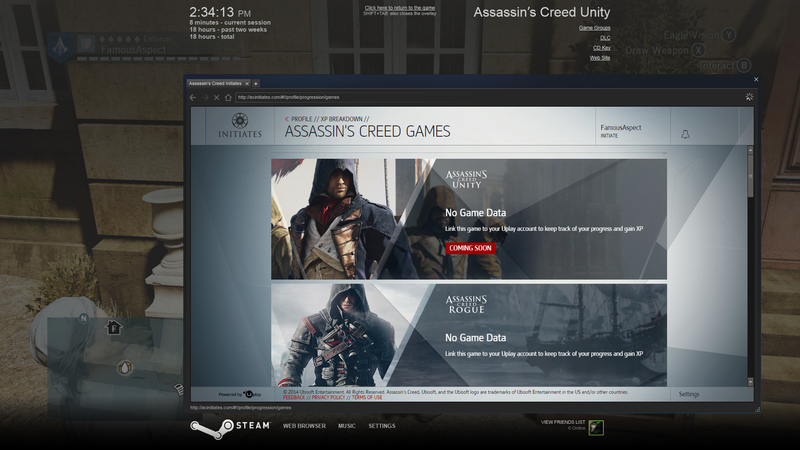 This all begs the question, how can Ubisoft do MTX and companion apps better in Unity? Given comments on previous pieces I’ve written on monetization, I expect the majority of players would say to remove them entirely. As I acknowledge the business reality here and expect these elements to become more prevalent in future blockbuster games, this is not a reasonable answer. From my perspective, a few minor changes could make these elements more palatable for gamers while retaining Ubi’s ability to earn additional revenue. 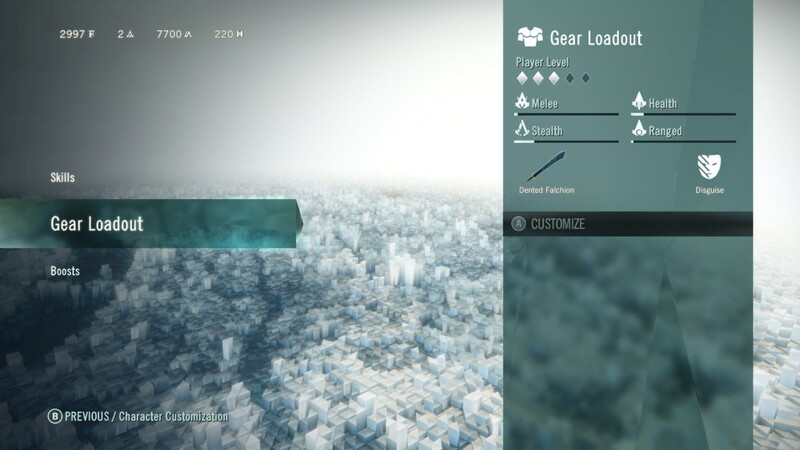 The companion app and Initiates program are more overtly thrown in the player’s face. 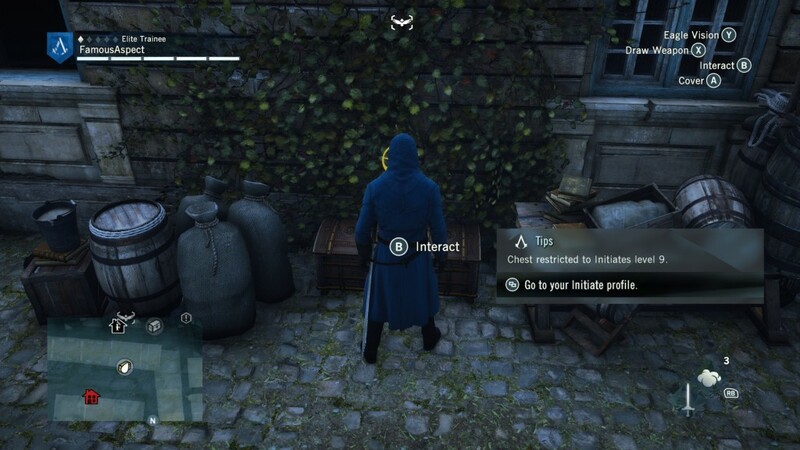 In my first mission as Arno, 30 minutes into my play session, I encountered prominently placed blue and yellow chests locked behind these features. I was not surprised that their inclusion in the first hour of play set off players’ and critics’ rage meters. 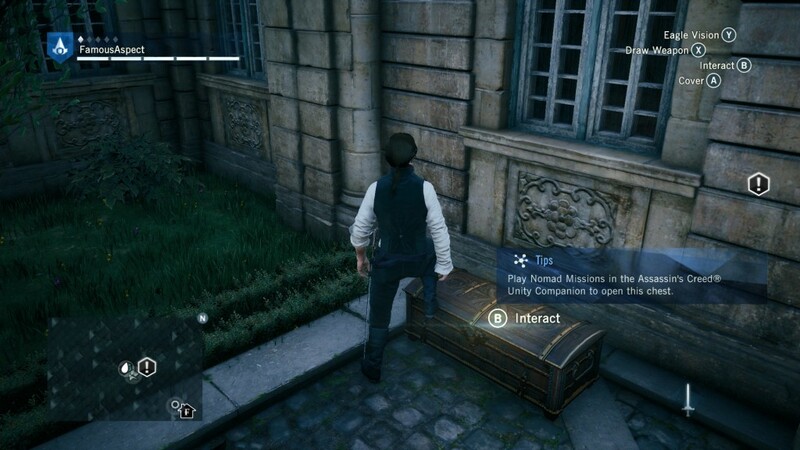 I am given startlingly little information about the Assassin’s Creed® Unity Companion app when I am blocked from my intended action of opening a chest. What is the companion app? What platforms is it for? Why would I want to play it? 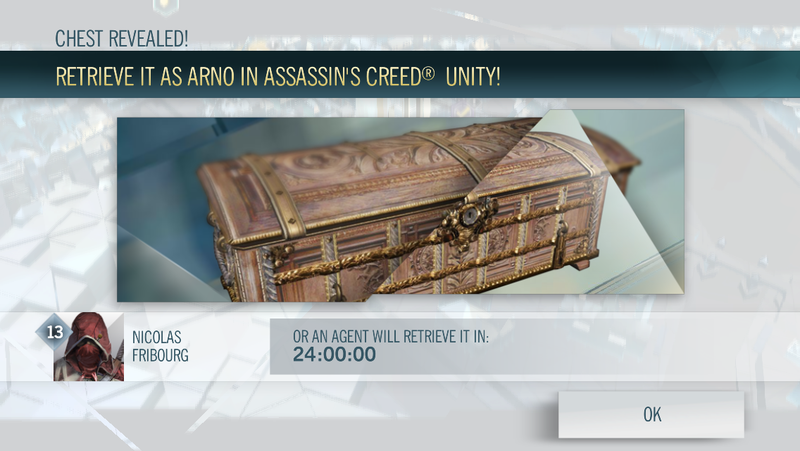 None of these questions are answered by Unity’s vague messaging. Additionally, a dialog box that would allow me to play this video should also allow me to turn these features off completely. The same way the vast majority of players will never spend money in a free-to-play game, the vast majority of players of AAA blockbuster games will never download a companion app. A simple checkbox on the bottom of a dialog with the option “Do not show me companion app features” will go a long way toward proving to players that you respect them. If you want a player to come back to your game year after year to give you $60, you need to prove that you view them as person and not a wallet. Upon finishing the story in Unity role playing as a big spender, I was left with a big question. Who are Helix credits for? Just because I have spent the past few years focusing on monetization design does not mean I fully understand those players who regularly spend money in every type of game. As a player type, I am more of a dabbler. With a backlog of unplayed games literally hundreds deep, it is rare that I am compelled to complete a game. Unless it is something like Shadow of Mordor that hits all my gamer happy buttons, faced with the choice between grinding side missions to gear up or spending money on in-game currency, I am most likely to just quit for another game. To find out more, I’ve put together this short survey about game purchasing, DLC and MTX. Whether you do or do not spend money inside of premium or free-to-play games, I would love to hear from you so that I can come back with answers in a future article.